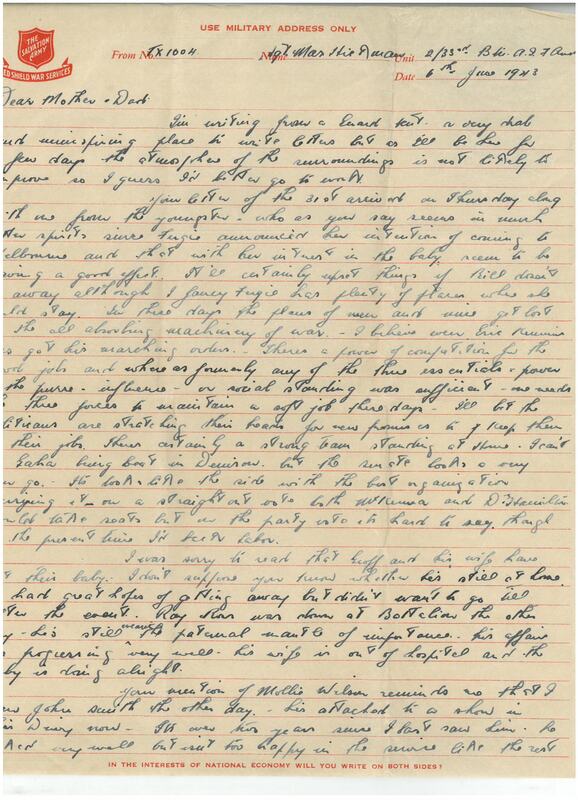 I’m writing from a Guard tent – a very drab and uninspiring place to write letters but as I’ll be here for a few days and the atmosphere the surroundings is not likely to improve I guess I’d better go to work. 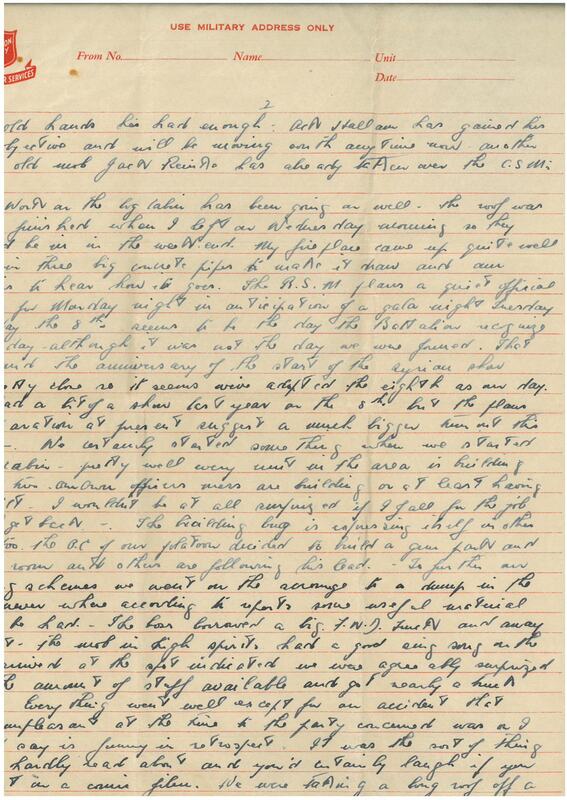 Your letter of the 31st arrived on Thursday along with one from the youngster who as you say seems in much better spirits since Fergie announced her intention of coming to Melbourne and that with her interest in the baby seem to be having a good effect. It’ll certainly upset things if Bill doesn’t go away although I fancy Fergie had plenty of places where she could stay. In these days the plans of men and mice get lost in the all absorbing machinery of war. I believe even Eric Kemmins (?) has got his marching orders. There’s a power of competition for the good jobs and whereas formerly any of the three essentials – power of the purse, influence or social standing – was sufficient, one needs all three forces to maintain a soft job these days. I’ll bet the politicians are scratching their heads for new promises to keep them in their jobs. There’s certainly a strong team standing at home. I can’t see Gaha being beat in Denison but the Senate looks a very open go. It looks like the side with the best organisation carrying it – on a straight out vote both McKenna and Dr Hamilton would take seats but on the party vote it’s hard to say though at the present time I’d back Labor. I was very sorry to read that Geoff and his wife have lost their baby. I don’t suppose you know whether he’s still at home. He had great hopes of getting away but didn’t want to go till after the event. Ray Ross was down at Battalion the other day. He’s still wearing the paternal mantle of importance. His affairs are progressing very well. His wife is out of hospital and the baby is doing alright. Your mention of Mollie Wilson reminds me that I saw John Smith the other day. He’s attached to a show in this Divvy now. It’s over two years since I last saw him. He looked very well but isn’t too happy in the service, like the rest of the old hands he’s had enough. Ack Hallam has gained his first objective and will be moving south any time now – another of the old mob Jack Reinke has already taken over the CSM’s job. Work on the log cabin has been going on well. The roof was nearly finished when I left on Wednesday morning so they should be in in the weekend. My fireplace came up quite well. I put in three big concrete pipes to make it draw and am anxious to hear how it goes. The RSM plans a quiet official opening for Monday night in anticipation of a gala night Tuesday – Tuesday the 8th seems to be the day the Battalion recognise as its day, although it was not the day we were formed. That date and the anniversary of the start of the Syrian show are pretty close so it seems we’ve adopted the eighth as our day. They had a bit of a show last year on the 8th but the plans in preparation at present suggest a much bigger turnout this year. We certainly started something when we started the log cabin. Pretty well every unit in the area is building one or two. Our own officers mess are building or at least having one built. I wouldn’t be at all surprised if I fall for the job when I get back. The building bug is expressing itself in other ways too. The OC of our platoon decided to build a gun park and orderly room and others are following his lead. To further our building schemes we went on the scrounge to a dump in the never never where according to reports some useful material was to be had. The boss borrowed a big FWD truck and away we went. The mob in high spirits had a good sing song on the way. Arrived at the spot indicated and were agreeably surprised with the amount of stuff available and got nearly a truck load. Everything went well except for an accident that though unpleasant at the time to the party concerned was or should I say is funny in retrospect. It was the sort of thing you’d hardly read about and you’d certainly laugh if you saw it in a comic film. We were taking a long roof off a pretty high shed and Ned thought it would be easier to strip the iron from the purlins with the whole roof on the ground. So they prised the rafters on which the purlins and iron were nailed from the template with pinch bars then Jim Mc raised one corner, Viv Abel another and with them gradually working along the template big Kong Young forced the centre up and another party with a long pole exerted pressure from the ground. Eventually they got the roof standing vertically at one edge. At this stage of the game the fellow with the pole was doing most of the balancing with the pole caught under one of the purlins to stop it from slipping. Then Jim & Viv let go and pushed it off the side. You can imagine the momentum that seven or eight hundredweight would gather, well the whole lot caught the log, swinging the bottom end up with a hell of a smack right on the point of the chin of the bloke holding it. It up-ended him very smartly and continued its upward track till released by the roof when it came down with a thud on the back of the head of the prostrate victim. We got him to Battalion as quickly as possible and the RMO sewed him up but his facial beauty is a bit torn about and his head has a few extra bumps but I believe he’s getting on alright. This guard is the first divvy guard I’ve cracked and although I don’t want the experience again it is quite an experience. There’s quite a good sergeants’ mess here and tobacco is much more plentiful than at Battalion. I must say cheerio now Mother & Dad. It’s nearly time to mount the guard for the next twenty four hours so cheerio for the present. Give my love to May, Anne and Carline and best wishes to Laurie & the boys. PS Can you send me a couple of sets of stripes – they can’t be got up here. PPS Am enclosing a couple more Griffins – I’d like you to keep them for the unit history. John Gaha, known as Frank, was the member for Hobart in the Tasmanian Legislative Council and the Health Minister in Robert Cosgrove’s Labor government. 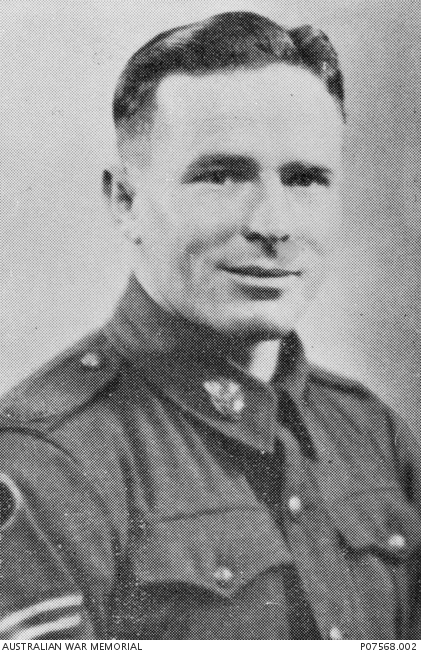 He was nominated to stand for the Federal seat of Denison in the August 1943 election following the expulsion from the party of Gerald Mahoney (see post of 23 May 1943). Jack had been a friend of Max’s since the voyage to England in mid 1941. He lost his life in the Liberator disaster. …from The Footsoldiers : Each company built large mess huts. Although never as elaborate as the famed log-cabin they were much bigger and able to seat 120 or so men. The roofs were of malthoid rolls of which thousands upon thousands of yards must have been used by the Army in the war. ……. Comparing the unit-lines and living-quarters and conditions of a combatant unit of the Australian Army with those of any US Army units either in Australia or in the islands of the Pacific : Where our men made makeshift hessian stretchers, the Americans had issued stretchers or sleeping bags. Where our kitchens, ablutions and toilets and the roofs of mess halls were of sisal craft or malthoid they had professionally built structures with standard walls and roofs of iron or asbestos fibro…. 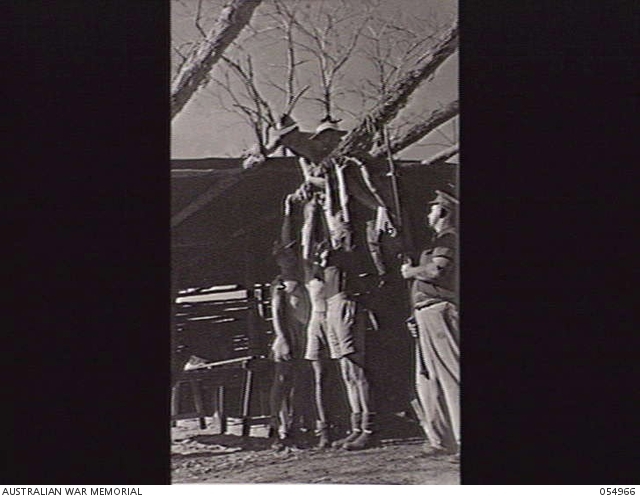 AWM 054966 : Troops of the 8th Australian Motor Ambulance Convoy at work enlarging the men’s mess. Mess is in log cabin style with iron roof. 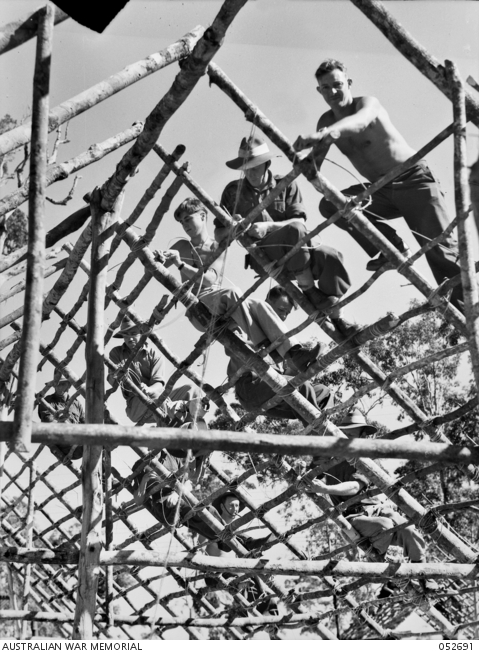 Mess Hut being built by troops of the Australian Army Service Corps, 9th Australian Division, at the Atherton Tableland training area. These huts are built of local materials. No nails or screws are used. Every joint is made by lashing members together with ‘lawyer vine’. 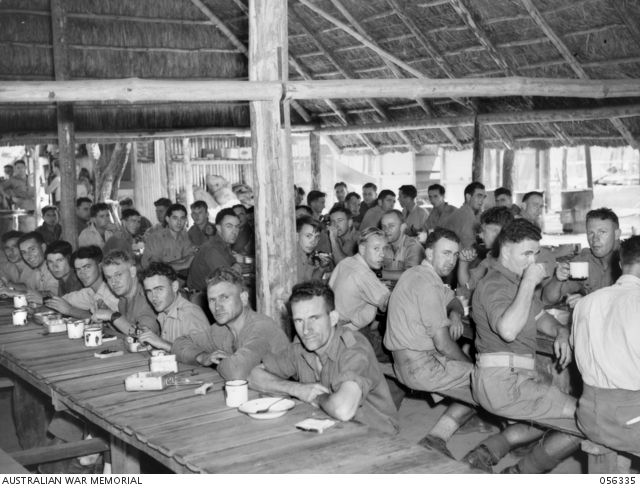 Troops of the 57th battery, 2/7th Australian Field Regiment, having lunch in their thatched mess hut. (a) Complaints have been received from local inhabitants that their land, fences and buildings have been interfered with by army personnel. In many instances wire has been removed from fences, fence posts used as firewood, doors and roofing material removed from buildings and in some instances buildings completely removed. 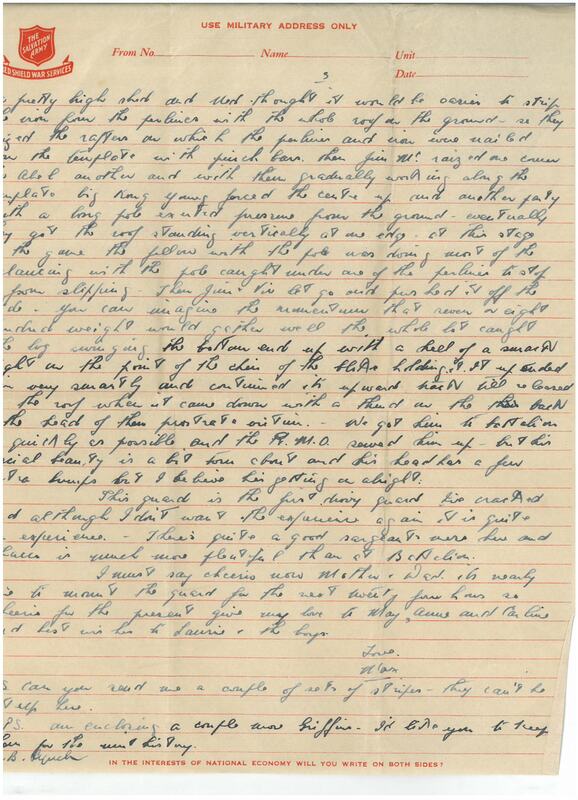 This entry was posted in escapades, relaxation, fun and games, guard/ picket/ orderly room duty, Tasmanian, unit and personal diaries and tagged Ack Hallam, Jack Reinke, log cabin, manpower, scrounging. Bookmark the permalink.